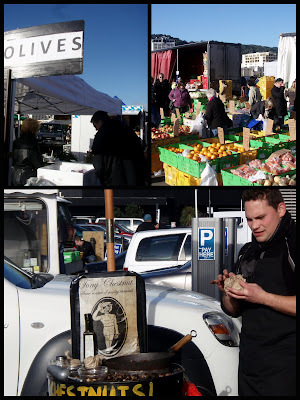 Since moving to Wellington about 5 years ago, I've been a semi-regular at Wellington's vege markets. For a long time it was the one on the corner of Vivian and Willis St, but now that I live closer to the waterfront I've been visiting the Waitangi Park Market, held each Sunday morning in the Te Papa carpark. The website has a list of the stallholders at the market as well as heaps of other information, so I won't do a detailed summary here but rather a quick overview of the highlights of my visit the other week. 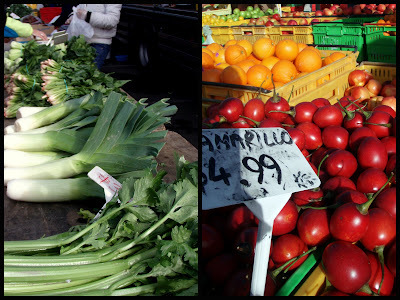 The market has your regular old fruit and veg sold by various local farms, and what's on offer tends to vary according to the season. Prices for seasonal produce are often way cheaper than supermarkets, too, which is a big plus (and the main drawcard for budget-conscious shoppers like me). The other week there were some beautiful-looking leeks, cauliflowers and broccoli among other greens - I couldn't resist. Another one of my favourites are the Thai/Cambodian herb stalls. 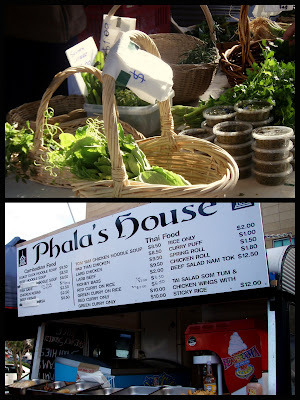 According to the list of stalls on the Harbourside Market website it seems that there are 2 - Thi's and Phala's, and I'm not entirely sure which one I have been to more, but I do tend to get my vibrant green coriander bunches and lemongrass from one of the two. While we're on the topic of Asian foods, there are a few stalls worth checking out, either for something to snack on whilst you shop or containers of food to take away. The Chinese Takeaway stall sells fresh noodles for your soups or stir-fries, as well as hot foods like steamed pork buns, wontons, and (I believe) more substantial meals. 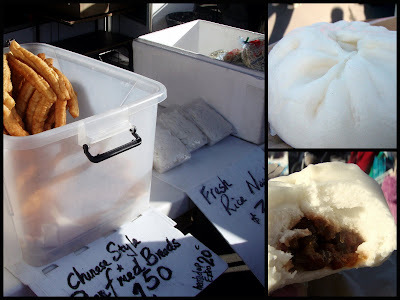 I'm a pork bun fiend, so I had to get one: it was light and fluffy on the outside, and the inside tasted suspiciously... homemade. Yup, I doubt these came from a frozen supermarket package (or if they did, a different one to the ones I usually get). Really delicious and perfect for a cold morning! 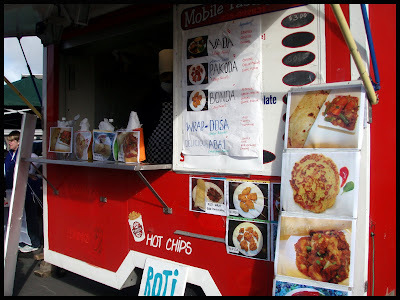 There were a couple of Indian stalls selling roti and whatnot, but I was particularly drawn to this red mobile because they offered dosa. I will definitely be trying it out in weeks to come, so you can expect to hear about it in more detail then! 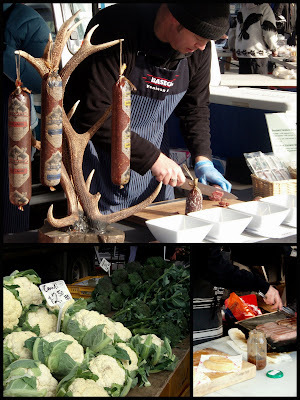 There are a number of artisan food sellers with a variety of products, a lot of which is available for tasting, which is what makes the market experience so fun. It's great to be able to connect with the people involved with the product instead of an anonymous face behind a supermarket counter. Salami, cheese, jam, sauces, breads, baked goods - it's all there. I've started to get most of my meat from the market too, since I live too far away from my favourite butcher in Kelburn to visit there often. 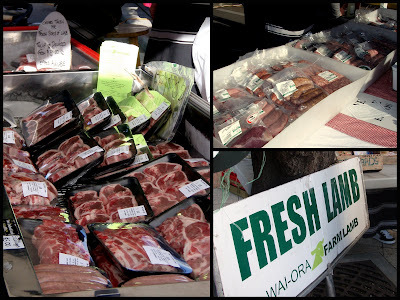 On this visit I bought a lamb roast from the lovely people at Wai-Ora Farm Lamb, which turned out beautifully. Bulls Bacon also has a stall selling (you guessed it) bacon and pork products, which I haven't tried yet but am very eager to. Will update on that one. 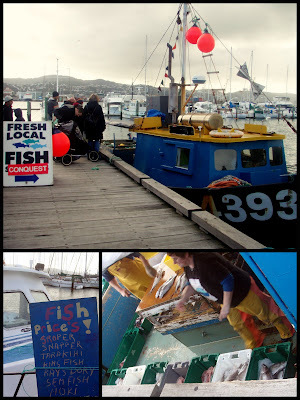 And, (excitingly for people like me who didn't grow up by the sea) there are a couple of boats which pull up to the dock and sell fish right off their decks. I haven't gotten any yet, but they do a roaring trade, so I suspect it can't be bad. Notably missing the other week was the Mac Snack stall... I think the time I was there before I heard the guy say he would be away for a few weeks, so fingers crossed he'll be back soon... I need my chocolate macadamia nut butter ($8.50) fix! Whew! This is starting to feel a bit like an advertorial so I'm going to end it here. (We are in no way connected with Harbourside Market - just avid shoppers.) There are heaps more stalls that are worth mentioning... perhaps I will have to report back at a future date. Definitely worth a visit, even if you're not the kind of person who likes to go shopping on a Sunday morning! Who knows, you might develop a new routine.